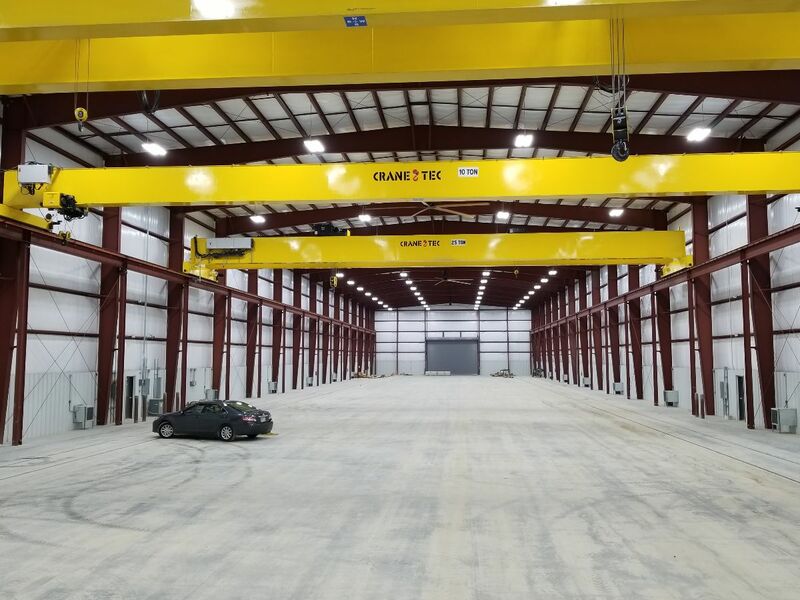 Overhead Crane Case Studies | Crane-Tec, Inc.
To provide a building supported crane system with two 25 Ton capacity and one 10 Ton capacity long span heavy duty cranes. The crane system was to be designed into the metal building structure of a regional railroad manufacturer for their “Frog” manufacturing. Frogs are railroad exchanges that divert trains from one line to another. Owner application required heavy duty high speed cranes. Independent tie back runway systems were designed to maximize the strength of the pre-engineered metal building. Working with the owner and the General Contractor we were able to design a building that supported the loads of 3 heavy duty high speed bridge cranes. We installed two 25 ton cranes, each with a 5 ton auxilliary hoist, and a 10 ton crane. These allowed the manufacturer to have three work areas which stream-lined their manufacturing. To provide our customer, a John Deere Dealer, with an integrated crane system for a new facility in Indiana. The project incorporated two 5-ton underhung cranes and runway systems. The general contractor needed design loading for the building and runway system. Single girder cranes with low headroom hoists were used to minimize runway and building steel costs. Crane-Tec engineers using the metal building drawing, designed a cost efficient and space saving runway system using the building frames to suspend the runway system. This maximized the strength of the building. Both cranes were supplied with radio remote controls for safe and precise operation. Crane-Tec supplied a complete engineered crane and runway system. The crane system was installed, weight tested, and turned over to the owner on time with a two year warranty. Two 2.5 Ton top running single girder cranes. Radio control operation for each crane, with the option to operate each crane individually, or in tandem. This feature allows the operator to link both cranes together and operate them simultaneously with one single button push, ideal for handling of long pieces of materials. Special anchors to attach the crane’s steel runway beam to the wooden building haunches. To provide a crane system to help our customer in their manufacturing of large concrete building panels. Our customer needed to move large concrete panels through their high capacity manufacturing process. Cranes were sized for heavy duty usage with high speed hoists, trolleys and bridges. Cranes were equipped with radio remote controls for safe and efficient material handling. The remotes allowed the customer to operate the cranes individually and in tandem. Crane-Tec provided our customer with a complete turnkey crane system that was customized to their manufacturing needs. To provide our customer, an electric motor manufacturer, with an array of lifting solutions for a large expansion of their facility. Our customer needed to be able to move large scale electric motors throughout their facility interacting with multiple workstations. Installing Two 25 Ton top running double girder cranes with a radio control system that allows the cranes to be operated in unison, or individually, with only one hand held remote. Installing eight 1-Ton column mounted jib cranes with electric two-speed chain hoists. Installing a 2-Ton floor mounted jib crane with an electric two-speed chain hoist. To provide our customer, an industrial metal parts stamping facility, with a safer and more efficient way to load their laser cutting machine. Our customer needed to be able to load the machine with a large piece of sheet metal quickly and safely. The machine was in a current manufacturing facility which had low ceiling clearance. Using an Anver vacuum air lifter with built-in air compressor to lift the sheets with ease. Crane-Tec’s highly skilled installers installed a state of the art lifting system in just under 24 hours, keeping our customer’s production staff with minimal down time. They are now able to load the machine more safely and efficiently. our customer, an injection molding facility, with a larger capacity crane to fit an existing runway system. The customer was upgrading their facility with larger machines and wanted to add a 7.5-ton top running crane to their existing 5-ton system. The existing crane, being lower capacity, had a shorter stature on the runway rail. With the customer needing a specific lifting height capability, and the building having a low roof, our engineers and staff were up to the challenge. A double girder crane, which allows the use of smaller beams to achieve the low headroom hook height. Radio control operation which allows the operator to stand at a safe distance from the load and move through the factory freely. A goose neck connection from beam to end truck to maximize lifting height. Duel hoist to aid in larger lifts and rotating molds for service. A warning light and buzzer to alert others in the building the crane is in motion. Crane-Tec delivered a custom built, state of the art crane. Following up with our customer, our staff was told with this new system, mold change down time has been cut by 2/3. 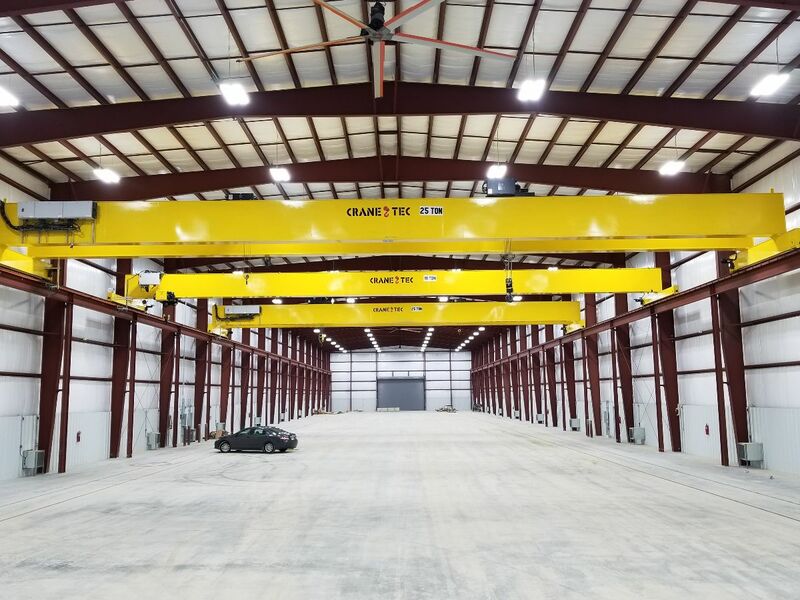 Throughout its 35-plus years in business, Crane-Tec has been equipping a wide range of industries with a wide variety of overhead crane systems, including runway systems, monorail hoists, and jib cranes. Crane-Tec has been a leader in furnishing, installing and servicing such systems. Its diverse customer base includes general industry, power plants, the aviation industry, concrete products manufacturers, the automotive industry, machine shops, place injection mold facilities, metal service centers, tool and die facilities, general fabrication facilities and waste water treatment facilities. In addition to designing overhead crane systems, Crane-Tec also does the fabrication and installation. Often times, Crane-Tec is presented the opportunity to design a freestanding overhead crane system. Although overhead cranes are custom designed to an extent (since the span and capacity are determined by the customer’s needs), a freestanding runway system is completely custom-designed. These customizations are sometimes the result of a building not designed for overhead cranes, which was the situation Crane-Tec faced when a leading fabrication and engineering firm in Indiana needed multiple overhead cranes and runway systems in a building that was designed for a different use. Custom design of an overhead crane system for this customer presented some unique challenges for Crane-Tec and its engineers. 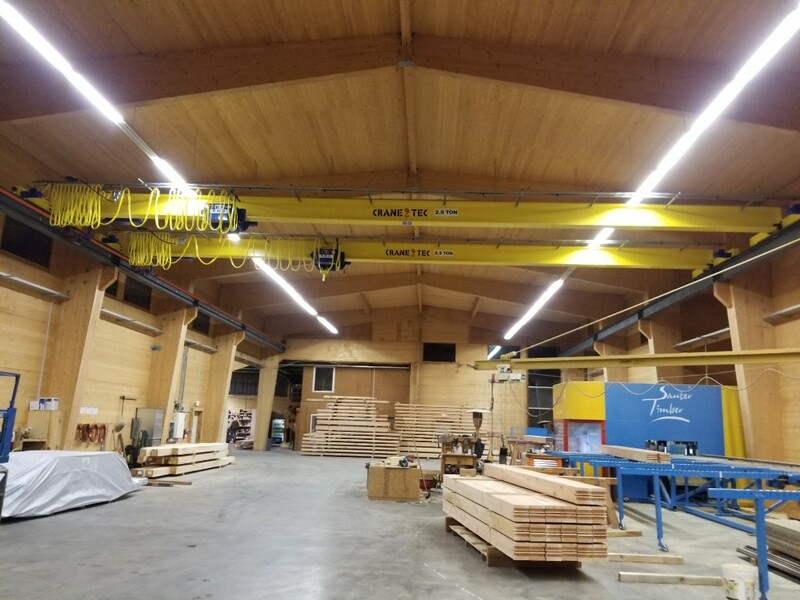 When Crane-Tec surveyed the building purchased by the end user, it was confirmed that the building was not designed with overhead cranes in mind. In this situation, Crane-Tec needed to design free-standing runway systems that were completely independent from the building structure. Another challenge was meeting the scope of work performed by the end user. As an integral part of the fabrication process, the user needed cranes to move components throughout fabrication, assembly, and loading the finished machines onto trucks. The cranes also needed to move machines in various stages of assembly from workstation to workstation within the building. In addition, the customer needed a crane system that would allow constant reconfiguration of work areas depending on what was being fabricated. A very large span for the cranes to keep the building’s floor clear of columns that would interfere with workflow. Jib cranes supported from the runway columns, which differs from typical jib crane installations where the jibs are usually hung from the building or stand independently. A multiple crane system to accommodate a workflow where heavy components are constantly moving. After multiple site visits, Crane-Tec determined that a 20-ton freestanding runway system was needed, which presented its own unique challenges. First, 20 tons is a rather high capacity for a freestanding runway system being designed to fit inside an existing building. Secondly, adding jib cranes to runway columns requires special columns and footers specially engineered for this project. 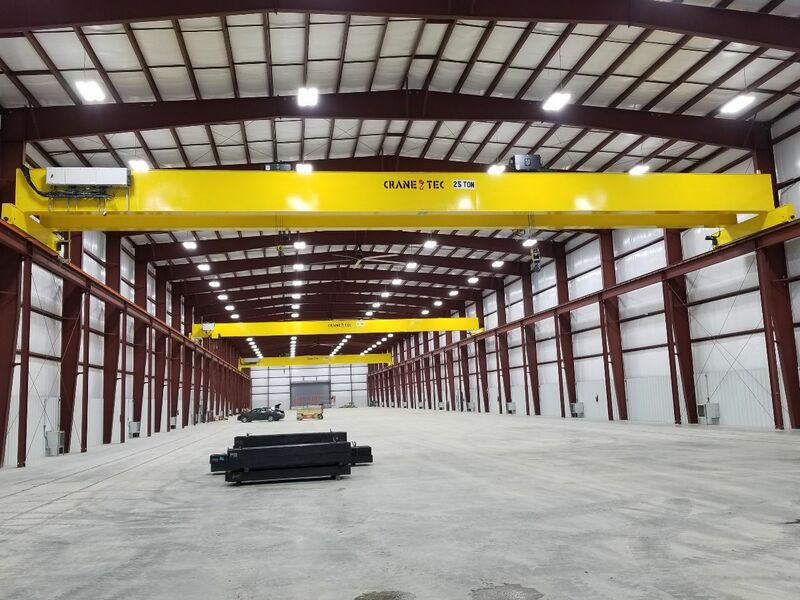 After addressing the needs and challenges of the steel fabrication and engineering company, Crane-Tec arrived at the solution of a 20-ton freestanding runway system; two 10 ton, 70-plus foot span single box girder cranes; multiple 2 ton jib cranes; and a 2 ton freestanding workstation crane. The solution was a result of Crane-Tec working with the customer to assess their needs, price out multiple options and determine the most cost-effective avenue for the customer. It’s common for customers to compare the cost of a number of different configurations since crane availability and the location of the runway columns will impact workflow. Many other factors come into play when deciding on the best overhead crane system for the application. In this case, however, functionality, workflow and cost were the three main driving factors. 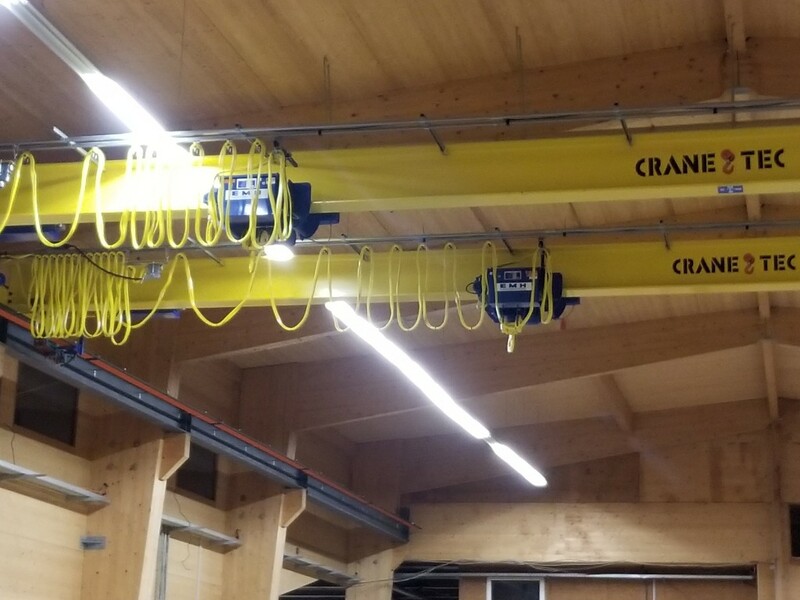 Once a solution was identified, Crane-Tec worked with the customer and the general contractor to design the customized overhead crane system. Since the freestanding runway system was being installed in an existing building, a site visit was needed to take accurate measurements and assess the structure’s layout. Runway layout is the most important aspect of an overhead crane system. Generally, the customer knows the required capacity of the crane. Crane-Tec then discusses with the customer how frequently the crane will be used and the size of the loads it will be picking up to determine the classification of the crane. With this detailed information, Crane-Tec engineers design, fabricate, and install the crane system. Installing such a complex freestanding crane system is no easy task, which is where Crane-Tec’s 35+ years of experience pays off. For the 20-ton freestanding runway system, the general contractor modifying the building had to install concrete footings. The Crane-Tec installation crew was also on site with the necessary installation equipment, including man lifts and a carrydeck crane. The Crane-Tec crew installed anchor bolts for the columns in the footing and then the columns were installed and shimmed to level. Next, the runway beams and crane rail are bolted to the columns and adjusted to meet exacting tolerances. The entire installation process took about 2-1/2 days. The 2-ton freestanding workstation crane was installed in the same manner as the freestanding runway system. The installation time was about two days. For the two, 10-ton, 70-plus foot span single box girder overhead cranes, the Crane-Tec crew installed the hoist and festooning on the crane girder, which is the main horizontal beam of the crane bridge that supports the trolley and is itself supported by endtrucks. Once in place, the crane girder, including endtrucks (or the wheels that support the bridge girder), was set on the runway. Assembling and setting the 10-ton cranes took about one day. The multiple 2-ton jib cranes were cantilever style, consisting of a steel beam with a hinge on one end. The hinge was bolted to the runway column. Then a hoist was installed on the jib crane beam. Each jib took one to two hours to install. Once all the cranes and supporting equipment were installed, the Crane-Tec crew spent a day starting up and testing all the cranes. Crane-Tec provides an overview on how to operate the equipment and safe operating procedures upon request. This is in addition to an operational and maintenance manual provided with each crane. The Crane-Tec freestanding crane system is already making a big difference in workflow and production levels for the steel fabrication and engineering firm. The two overhead cranes allow the company to move and position materials before and during fabrication, thus improving time efficiency. The overhead cranes are also utilized for unloading raw materials from trucks, loading fabricated goods on trucks, and moving steel/machines during fabrication from one work area to another. Without the freestanding crane system, none of this production work could have been performed in the building. The only other option was for the steel fabricator and engineering firm to free up considerable space in the building so materials could be moved by mobile cranes and large fork trucks, a consideration that was not feasible from a cost or work efficiency standpoint. The Crane-Tec crane system is providing time-saving processes and an easier workflow. The company has already justified the expense of installing the freestanding runway system, single box girder overhead cranes, jib cranes, and freestanding workstation cranes, and is well on its way to realizing its return on investment. Steel Warehouse Facility 10 ton cranes with dual 5 ton hoists. Crane-Tec supplied (2) 10 ton dual hoists cranes to a steel warehouse facility in South Dakota. Considering the customers business and expertise the customer supplied steel for the project and saved thousands. Crane-Tec crews installed the crane, crane rail and electrification successfully without a hitch. The cranes were equipped with hoist summation overload limit devices, bridge travel limit switched and radio remotes with hoist A – hoist B selector switches for simultaneous and independent control. This is the second set of cranes the customer has purchased from Crane-Tec and we look forward to continuing to work with them as they grow. Crane-Tec just completed the turn-key Design, Fabrication and Installation of a 25 ton long span crane for a mine maintenance facility in the Midwest. Crane-Tec was contacted by the General Contractor to supply drawing and assist I in the design phase. Crane-Tec supplied and installed the overhead crane, crane rail and electrification on-time and to a satisfied customer.